"Using MRI scans, scientists at University College London found structural differences in the brains of people with liberal and conservative political views." "'Previously, some psychological traits were known to be predictive of an individual's political orientation,' lead author Ryota Kanai from University College London's Institute of Cognitive Neuroscience said in a statement. 'Our study now links such personality traits with specific brain structure.'" "People with self-reported liberal views tended to have a larger anterior cingulate cortex -- a brain area involved in processing conflicting information. And those with conservative views were more likely to have a larger amygdala...'Individuals with a large amygdala are more sensitive to fear,' and might therefore be 'more inclined to integrate conservative views into their belief system,' Kanai (lead author Ryota Kanai from University College London's Institute of Cognitive Neuroscience) and colleagues wrote. 'On the other hand, our finding of an association between anterior cingulate cortex volume and political attitudes may be linked with tolerance to uncertainty' -- which may allow people to 'accept more liberal views.'" "'I'm glad to see liberals have a large anterior cingulate cortex -- the more sophisticated part of the brain,' he said. 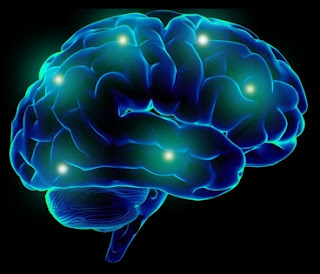 "The brain can change over time based on a person's experiences -- an adaptation called neuroplasticity. Whether this could change a person's political views remains to be seen. It could be, rather, that changes in political attitude impact brain structure, Kanai and colleagues wrote." Perhaps further gains in neuroscience can create a process to change Conservative sheeplets views into the more civilized views of Liberals, thus saving us the expense of imprisoning them with the real culprits - the Conservative leaders. In another study, "data from the National Longitudinal Study of Adolescent Health (found that)...(y)oung adults who subjectively identify themselves as 'very liberal' have an average IQ of 106 during adolescence while those who identify themselves as 'very conservative' have an average IQ of 95 during adolescence...Young adults who identify themselves as 'not at all religious' have an average IQ of 103 during adolescence, while those who identify themselves as 'very religious' have an average IQ of 97 during adolescence." "IQ means, 'An intelligence test score that is obtained by dividing mental age, which reflects the age-graded level of performance as derived from population norms, by chronological age and multiplying by 100: a score of 100 thus indicates a performance at exactly the normal level for that age group.'" They also display an interesting map of the States, "where the red states represent Republican Tea Party states and the blue states represent Democratic/Liberal states(. Y)ou will see the average IQ of the population of those states. Notice anything interesting? 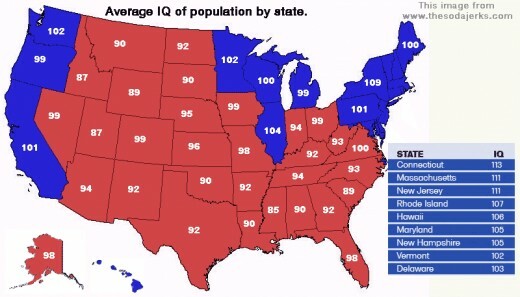 The IQ's of the blue states are considerably higher than the red states." This poster, having an IQ higher than 100, has no idea if Conservative sheeplets with IQs lower than 100 would be amenable to potential stem cell therapy with the potential of boosting their IQs and turning them into productive, liberal citizens. Perhaps that is why their leadership is so adamant against stem cell research. Quite a paradox when the sheeplets are conditioned against supporting scientific research that would benefit their own self interest. Marie: All I'm saying is that somewhere out there is the man you are supposed to marry. life knowing that somebody else is married to your husband.